In 1984, Pat and Lynn McConnell started a trucking company. The company, based out of their Berlin, WI home, consisted of five employees, three trucks, and operated under the “Fairwater Sand Transit” name. They rented a small maintenance shop from Badger Mining Corp. in Fairwater, WI. The company was an intrastate carrier that focused on hauling sand to several Wisconsin foundries. The company began to transition from an intrastate trucking company to an interstate operation in 1987. At that time, it was renamed to “Freight Lime and Sand Hauling”, but operated, and still does, as “FLASH”. Among these changes, FLASH began to diversify within the trucking industry. In 1987, FLASH began hauling lime to paper mills. 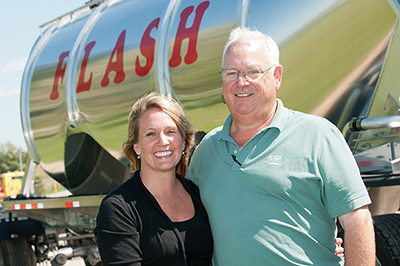 By 1989, the company was hauling food-grade products, and in 1990, FLASH started a waste hauling division. In order to accommodate for the company’s expanding efforts, in 1989 a maintenance facility and office were purchased in Green Lake, WI. FLASH had seven trucks and seven trailers within the fleet. FLASH has worked hard to stay ahead and maintain its competitive edge. In 1995, computers were installed in every tractor and computerized dispatch was implemented. Not only did this improve communication between drivers and dispatchers, but allowed GPS tracking and tractor information. This allowed FLASH to improve its efficiencies, but also improve the company’s safety program. By 1999, FLASH had outgrown its facility again, so a new Corporate Headquarters was built in Green Lake, WI. The new facility provides 5,000 sq. ft. of office space and a 20,000 sq. ft. maintenance facility. As a means to control costs and ensure quality, all maintenance is performed in-house. A 5,000 sq. ft. state-of-the-art tank wash facility was included at corporate headquarters to ensure contamination-free deliveries and quality customer service. In 2000, FLASH decided to return to its core business of serving foundries and the paper industry. Between 2000 and 2006, FLASH discontinued the food and commercial waste hauling divisions. The computerized dispatch system was upgraded in 2004 to a Qualcomm satellite communication system. With this, information can be gathered at a more detailed and accurate level, such as mileage rates, speeds, and load information. In addition, it serves as a tool for FLASH’s strict safety program and as a way to control emissions and other regulatory standards. In 2007, FLASH expanded its service to the foundry industry and began hauling pig iron and foundry coke in dump trailers. This has given FLASH additional capabilities to serve its customers. The company underwent another business expansion in 2009 when they started a transloading operation, Transload Solutions, LLC. This company provides rail-to-truck transloading services. Pat and Lynn have worked tirelessly to not only build a successful company, but to create a company that is dedicated to the customer. Long before the company celebrated their 30-year anniversary in 2014, the company had grown into a true value-added organization; providing services to our customers on the premise of relationships, moral character, and hard work. They have instilled that culture throughout the organization. Customers are not a commodity; relationships means something. The culture of a family business extends to the employees and customers. Employees are appreciated, and so many tenured employees have become like family. Today, FLASH employs 135 employees, with operations in seven states; operating 100 tractors, 150 trailers, hauling more than 1,200 loads per week, throughout the United States and Canada, and averaging 8 million miles per year. 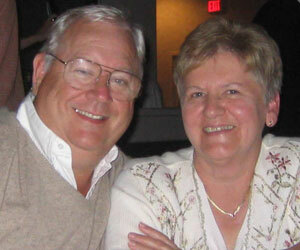 The company Pat and Lynn McConnell started remains a family-owned company. Pat and Lynn’s daughter, Mandi, joined the company in 2008, to lead the sales and marketing efforts while learning the various aspects of the business. In 2014, Mandi assumed the role of President. Pat remains the CEO of the organization. Much of what she has learned from her father provides a great building block to grow the company into its second generation.